Mike Ullery Jr. was rushing to a high school football game in Midland, Michigan, on Friday when he witnessed a patriotic act that stopped him in his tracks. He saw four teenage boys rushing to the game. When the national anthem started playing, they stopped in their tracks. 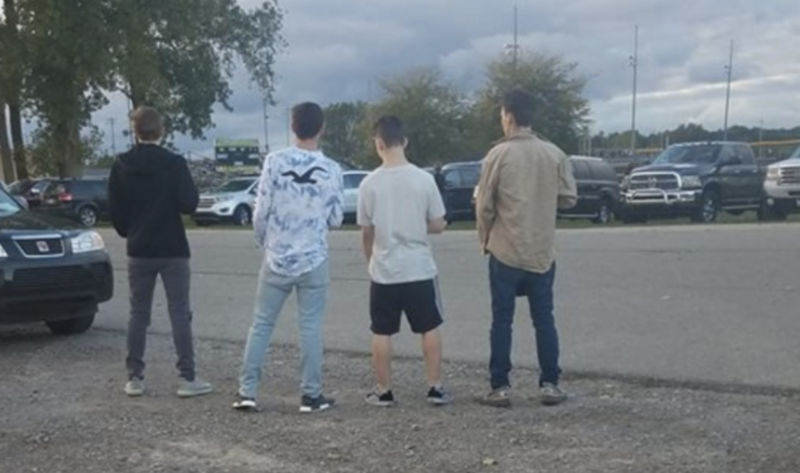 All four boys, students at Bullock Creek High School, stood in the middle of the parking lot. As the anthem began to blare, the teens showed their respect for the song and took their hats off to salute the flag. Ullery was surprised by their patriotism and decided to take a photo of the young men. "I was impressed by these Bullock Creek boys. Running late to the game they heard the national anthem and stopped, took off their hats and placed hands over heart," he wrote in a Facebook caption accompanying the photo. "Respect." "I was just proud of them, so I just snapped a picture and hoped it would get back to them when I posted it on Facebook," Ullery told CBS News. The dad's photo has gone viral since he posted it on Friday. Ullery said he didn't talk to the boys at the time, but has since been in contact with them. "I had no idea who they were. I didn't find out who they were until they commented on my Facebook post," he said. Several Bullock Creek parents commented on Ullery's post as well, and helped identify Dakota Lehner, Mikiah Lehner, Taylor Cox and Collin Hitchingham as the four boys in the photo. Many of the commenters agreed with the thoughts Ullery wrote in the caption of the photo. "Great kids," one person wrote. "Impressive. Great parenting!" another commenter said.